There are ways to get around this. Mainly use some other app or Quicktime to turn the image sequence into a video file. I recommend shooting RAW when shooting time lapse, so this means you have to pull the RAW sequence into one of the Adobe apps anyways (Lightroom, After Effects, Premiere) for color correction. It would be much nicer if FCP just handled it correctly without having to jump through the Adobe apps. Once you’re in the Adobe system, you might as well stay there, IMO. No, I’m not a FCP X hater. I just like my apps to work the way they should… just as I tore into Premiere and praised FCP for their .f4v (Flash video) support in this blog post. Great blog about FCP rendering and Timelapes sequenceing! 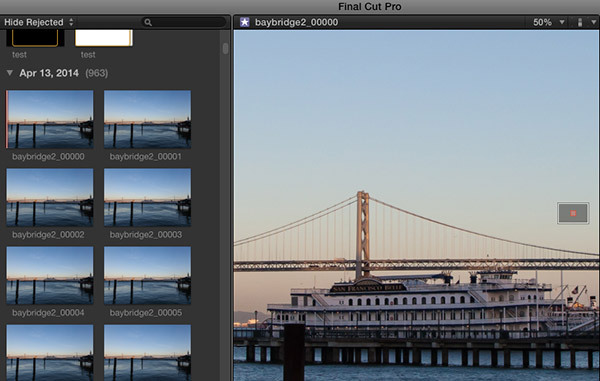 However some just taught me a way to get your photos into FCP for a time lapse and then set it up. If you email me at the above I will discuss with you. I just finished one 900 images. There are ways to do it, but it’s something that FCP should just support. It’s silly that they don’t. But feel free to post your technique!